With nearly 60% of marketers working in teams of only one to five people, it's no wonder that small marketing teams are often tasked with doing more, but with fewer resources. But even with these challenges, small marketing teams can make the best of their situation by utilizing their strengths of agility, creativity, and adaptability, and by focusing on the efforts that give them the best return on investment. However, even with this sound plan, it's not always a smooth ride to success. 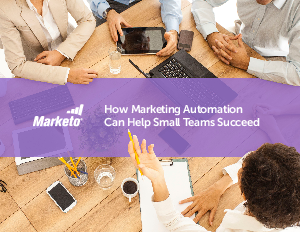 As a full, comprehensive solution, small marketing teams should look to automate their processes through the use of a marketing automation platform. This strategy can effectively help to conquer small team woes and drive success, making the team appear not so small after all.